My pool book gives you the most important rules in 20 chapters to play better pool. The 20 rules are dealing with issues even advanced players have – and beginners of course. Every chapter starts with an easy to remember rule which helps you to recall the content of the chapter and put it into action. You get the ebook for Amazon Kindle, Smartphones, Tablets and ePub-compatible reading devices as well as a printed version. Currently skilled players are coming up to me and saying I have good technique, which simply is based on the book. Less skilled players are saying I’m “a natural” – not realizing I’m just doing what the book says. 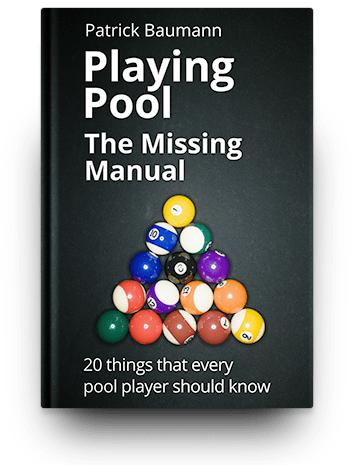 “Playing Pool – The Missing Manual” sums it up in a competent and entertaining way. I like the style of writing that mixes up the pool world a bit. Awesome book on playing better pool. It is well written, concise and helpful for expert or novice. I’ve been playing billiards at a high level for many years and I extracted nuggets from this tome that has improved my game. and 15 more things to play better pool. Not only is this book packed with important advice, it’s also written in an easy to understand and entertaining way. The concepts of the book are illustrated with lots of pictures and illustrations.